Susanna and Nancy wish you a very Happy Halloween! Tonight is our Annual Garlic Dinner, the 21st annual Garlic extravaganza to be exact. Although the tea room has been open for 23 years, our traditional Halloween celebration of the stinking rose apparently didn't start until we were two years into this adventure. We have continued this tradition - putting garlic into every course of the meal, and tonight is no different. As part of the menu, our guests will be enjoying Chocolate Covered Garlic Cloves. We served something similar in 2008, and you can find the post and recipe here. But, this year, we are trying a slightly different recipe which I found on the Internet. This very simple recipe is adapted from The Garlic Book by Susan Belsinger. You can find the recipe here. Fresh whole garlic cloves are simmered in a combination of 1/2 c. red wine, 1/4 c. sugar, and lemon peel for about 20 minutes. Once tender, remove lemon peel and drain garlic. Melt bittersweet chocolate (I used a combination of Ghirardelli's bittersweet and semisweet) as directed on the package. Dip each clove into the chocolate, and place on a wax paper lined tray. Chill until chocolate is firm. Place garlic cloves in candy cups and serve to your guests. These are best eaten 24 - 48 hours after preparing them Enjoy! The gardens are decorated for the season - witches, ghosts, goblins, ghouls, and pumpkin people are tucked here and there throughout the garden, including the greenhouse, the gazebo, and the arbor. They all seem to come to life when the sun sets at night. Our Halloween Teas have been served for 2013. We had 2 sold out afternoon tea events this year, with a waitlist for both of them. We are talking about adding a third Halloween Tea to our Calendar of Events for next year! It's a festive and fun afternoon. The chocolate acorns were a fun addition to the menu, and enjoyed by many. Tasty Pumpkin Ginger Scones and fresh fruit comprised the Scone course. And for dessert, Mummy Gingerbread cupcakes, Candy Corn Cookies, and Ghostly Lemon Tarts completed the menu. 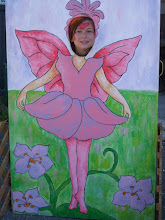 Halloween Fun in the garden... we recently held a Pumpkin Fairy House making workshop. Fairie Godmother, Patti Van Brederode, guided the crafters through the evening as they lovingly selected the perfect pumpkin, carved the windows and doors, and embellished the pumpkin to provide the wee folk a warm and cozy home. Apple Cider Heads or Any one you know? We recently enjoyed a Halloween themed dinner when one of our out-of-town sisters was visiting. And, as part of an ongoing birthday month celebration, by request, there was ham and broccoli quiche. To add to the festivities of the evening, I made shrunken apple heads to float in the warm and spicy apple cider. Directions on the Martha Stewart website can be found here. Simply cut the apple in half, peel them, carve faces on the round side of the apple, soak in lemon juice, and then slowly bake in a low oven for several hours. When the apple heads are lightly golden brown, shriveled and shrunken, poke cloves into the eye sockets. Float in a tureen of warm apple cider and enjoy with your Halloween celebrations! We love Pinterest! From the clever ideas, to the gorgeous photography, to inspiration and creativity... we appreciate what is shared between friends. These edible acorns have been featured on Pinterest, and we have been having fun sharing them with during a family dinner and including them as part of our fall centerpiece for the Halloween tea held this past Sunday. Very easy to make, directions and additional photographs can be found here. Simply remove the outer wrap from Hershey kisses, spread a little chocolate icing on the flat bottom of the kiss and attach a miniature 'nilla wafer to the kiss. With a small bit of icing, attach a butterscotch chip to the top of the 'nilla wafer. Let them dry before wrapping to store until use. For variation, substitute miniature nutter butter in place of the 'nilla wafer and use a chocolate chip for the top instead of the butterscotch chip Either way, they're yummy! 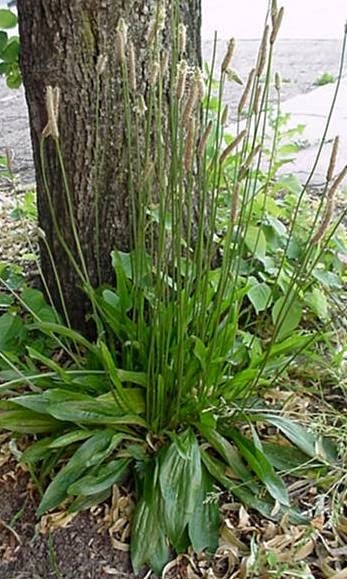 This common weed, Plantago major, sometimes called Pig's Ears around here, is an absolute favorite herb to know for bug bites and bee stings. If you are afflicted with a bug bite, simply grab a plantain leaf and crush it a bit and heat it if you can too. You can heat it by using a lighter, or chewing it or warming it in the palm of your hand. Apply it as fast as you can to the bug bite. It has a drawing action and will pull the venom out of the bite. I have seen it work and have experienced it working over and over again. It is amazing how a bees sting will just be a small little bite if you get the plantain on it quickly. Also called 'white mans footprint' because this little plant's seeds traveled here from Europe in the hooves of the animal. It continued to travel across our country as we made pathways and clearings. It often grows along the edge of the path were the sun will reach. 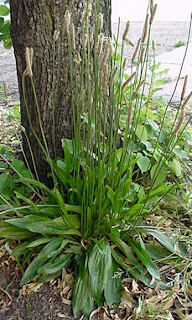 This is the cousin lanceleaf Plantain of Plantago minor. It is also effective on the bug bites. Psyllium Seed (like in Metamucil) is from another variety of this plant, Plantago ovate. Last month we entertained a special event Tea Around the World which featured a complete afternoon tea coupled with a special presentation by Janet Young from Over the Teacup. The first course concentrated on the Mid-East. We served a Pumpkin Spice Hummus with Assorted Crackers garnished with Fresh Figs from our garden. The main entrée was a bit more international. There was a Broccoli Quiche, Usha's Indian Curried Rice, and 'Eat Tea' Savory Spirals. Did you know that quiche originated in Germany, and then the French adapted their own version by making Quiche Lorraine. While in England, quiche became popular shortly after WWII and then, working its way to the United States, it became the fad food of the '70s. Our scone course represented England of course. Traditional English Cream Scones and Pumpkin Ginger Scones were served with true Devon Cream, Lemon Curd, and a Triple Fruit Marmalade, imported from England. After a quick hop on the Eurostar Chunnel from England to France, we savored Coconut Madelaines and Lemony Macarons. Following the international meal, Janet presented her program, sharing the beautiful enamel samovar from Russia and a unique assortment of tea accoutrements, history, and tea lore representing China and England. This was a delightful afternoon of travel, without any of the concerns about security issues or missing connecting flights. We love our oversize teacup that graces our herb gardens. It was purchased at auction in 2005 when a beloved local amusement park, (Williams Grove) shuttered its doors. The cheerful yellows and oranges and reds had been showing their age but it is difficult to find a "tea cup painter". Finally! A friend of sister Marj came through. Marj lives in the beautiful town of Jim Thorpe, PA.
Jim Thorpe has become a mini artists colony of sorts and she introduced us to her friend David. We were lucky that this Regional Pennsylvania Artist, David Watkins Price was willing to travel from Jim Thorpe. He spent two days working his artistic magic on our special tea cup. We gave him complete reign on design and colors. He was to paint what inspired him. We loved it at this point, but when he finished it off with the veins and the lace on the inside of the cup we were thrilled. Thank you to David Watkins Price, talented painter and author. His most recent book of poetry (available as an E-book on Amazon) is Voices of the Hollow Maze. As mentioned in the previous post, our trail ride down the mountain in the Cataluña region of Spain led us to this medieval watch tower and church. The Torre de Riner, built in the 13th century used to be quite tall, but as years passed, the stone from the tower was used to construct this local church. Such a hidden treasure in the mountains, far from the massive hordes of tourists, secluded on the mountain top, with a local equestrian as the keeper of the keys. Maintained annually by Monks, it is in wonderful condition. We were thrilled to discover a part of history coupled with the beauty of the country in this serene and tranquil spot. Rosemary, 'Dew of the Sea"
In addition to tea rooms and museums and herb shops and markets, when we travel we like to include a trail ride. It makes Angelica, our horse girl, happy and we all enjoy the experience as well. This summer time ride in Spain was down the side of the mountain, with the destination being that church and Medieval Watch Tower seen in the distance. I found myself surprised when I looked down to see that we were riding down a hill side with an abundance of Rosemary and Thyme. To the left and right we were surrounded by Rosemary. Rosemary or Rosmarinus translates to "Dew of the Sea". It is native to the warm Mediterranean region and will flourish in a sunny garden in the summer. While I have always started mine by cuttings, as evident by the mountain side it will start very easily by seed as well. Rosemary requires good drainage (which a mountain side would provide). It can be taken inside in the winter but would prefer to have a cool sunny area. It can take temperatures down into the 20's so protected porch or garage can often be the best spot for Rosemary inside. It has a long history of use in many cultures, we use it liberally in our cooking biscuits, salads, dumplings, vegetables, soups, poultry and of course in all Mediterranean cooking were Rosemary is invaluable. Cosmetically, it is used as a hair rinse and as a relaxing bath for sore muscles. Rosemary is the symbol of Remembrance and can be used symbolically at important occasions weddings, births, funerals. It is also used as a study aid to help you remember your facts.